Hi everyone! 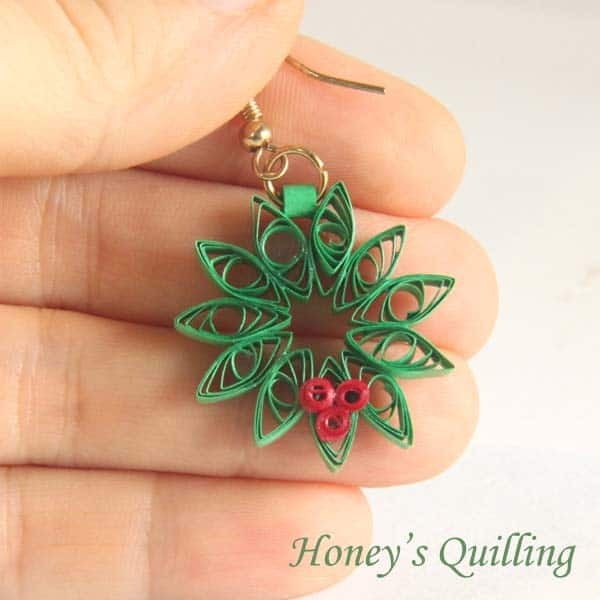 This is Honey from Honey’s Quilling where I share a lot of paper quilling tutorials, tips, and tricks. 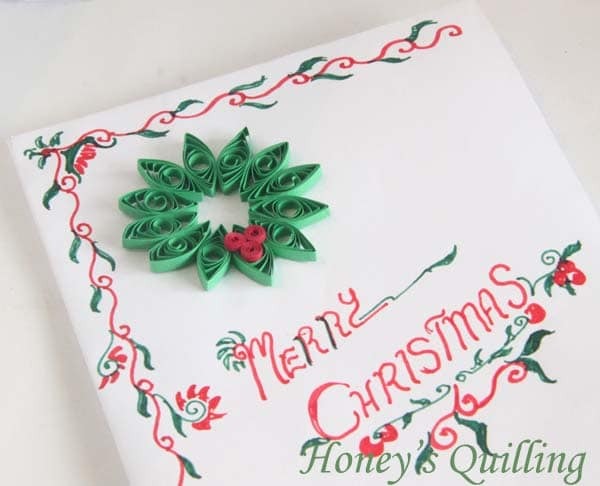 I’m thrilled to be here on Red Ted Art today sharing a paper quilling tutorial. 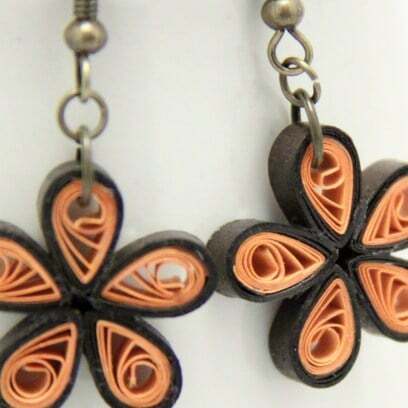 Although I love all crafts, paper quilling is my favorite. I started paper quilling when I was 10 years old, with just a toothpick and some paper strips I cut with scissors, so I know anyone can do it! 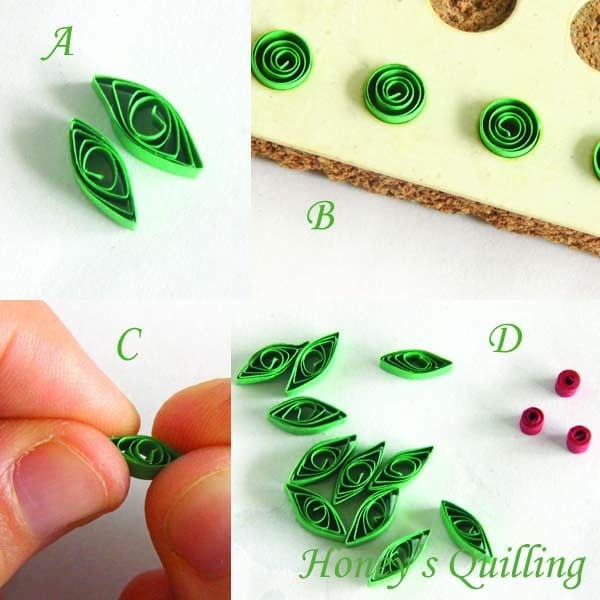 (We also have this super cute “Beginners Paper Quilling Project” – using larger curls for smaller hands). Today I’m showing you how to make these fun Christmas wreaths. 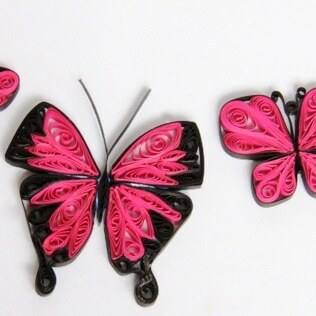 There is a smaller one, which is perfect for earrings, gift tags, placecards, etc. And there is a bigger one that is perfect for greeting cards. You can even make a larger one, just follow the pattern using longer paper strips! If you don’t have paper strips, click here to learn how to cut your own! 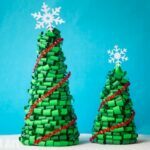 Roll each strip of green paper on the slotted quilling tool, take it off, and let it expand. You will have 22 loose coils. 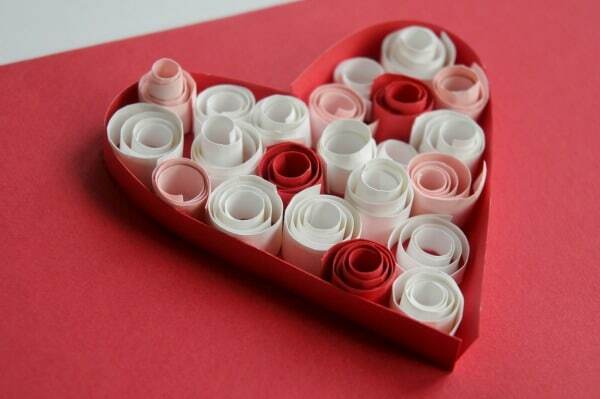 Use scissors to cut the strips of red paper in half so they are very skinny. Roll each into a tight roll. Do not let it expand when you take it off of the tool. Glue the end so it stays in a tight roll. You will have 6 tight red rolls. Now it is time to shape your green coils. First you need to glue them shut, making sure they are all the same size. Notice in the part A of the photo below that there are two different sized shapes. Both of them were the same size loose coils, but it can be tricky to get them to be the same size when you glue them shut, so you can easily get shapes that aren’t the same size. This is where a circle sizing guide comes in handy! I used the smallest size on mine seen in part B. You can use a ruler that has holes in it for stenciling, or you can make your own circle guide with styrofoam and pins (see link above in materials). So once you have made sure all of your circles are the same size and glued shut, pinch them on both ends to make marquis or leaf shapes (part C). When you are done you will have 22 green marquis and 6 tiny tight red rolls. Time to put together the wreaths! Glue the marquis together one at a time, gluing them near one end so they curl around into a circle shape. When you stick in the last piece you might have a pretty good circle, or you may have to re-adjust a bit. If you need to, pin some of the pieces so they stay in place while drying. I find that sometimes I glued it just right and I don’t need to re-adjust or put pins. But sometimes I do! Now to add the embellishments. Dab three drops of glue on the piece that you want to be at the bottom. Use your fingers or tweezers to place 3 berries. If you want to make earrings, roll the 1 ½” strips of green paper into tight rolls, glue shut, and glue them in place between two of the marquis right across from where you glued the berries. If you are using your wreaths on cards, you are done! If you want to make them into earrings, you can now add a sealant and/or topcoat to make them sturdy and water resistant. Without it, they are very delicate! Here I am using Ceramcoat All Purpose Sealer (you can get it at Michael’s or Joanne’s in the USA, or other craft shops). I paint it on with a small stiff brush in several light layers. Use VERY light layers. If you glob on a whole bunch the coils will come open and it will not look nice. So just brush a tiny bit on one side, let it dry a few hours, repeat, turn over, repeat a couple more times, and then when it is pretty sturdy you can give it one last more thorough coat. Now add your jump ring (I use a 5mm jump ring) and earwire. You can be finished then, or to make sure it is very water resistant you can add a topcoat like Diamond Glaze, Crystal Coat Glaze, 3D Crystal Lacquer, Mod Podge, PPA or others. There are many options that work! 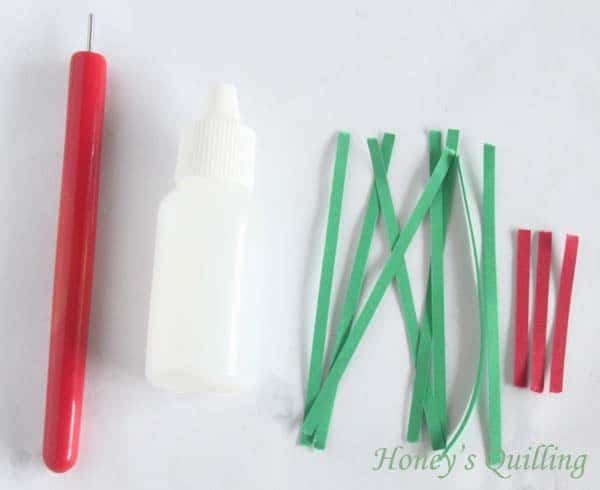 Click here to read about sealants and topcoats for paper quilling. Want to make a larger wreath for a card? For the card in the photo below (I folded a paper in quarters to make that card) I used strips of paper that were 6” long for each marquis instead of 3”. And for the berries I used paper that was 3” long instead of 1 ½” long. 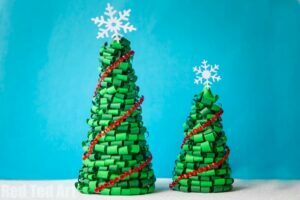 Use longer paper strips for even larger wreaths! Here are some photos of the wreaths being used as earrings, on a gift tag, and on a gift card. You can use them to decorate gift bags, party packs, placecards, so many things! 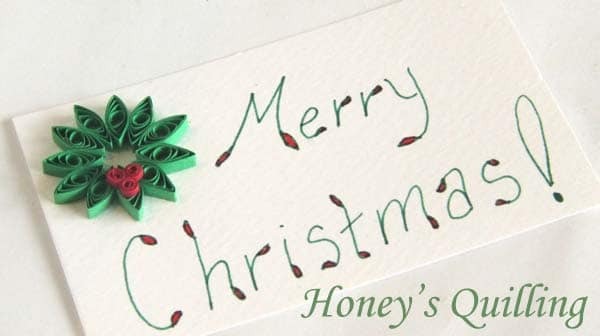 Or use them as Place Cards or Christmas gift tags.. so many ways to play with these Paper Quilled Christmas Wreathes!! 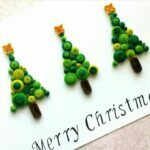 They would make cute little Paper Quilled Ornaments too! GORGEOUS! 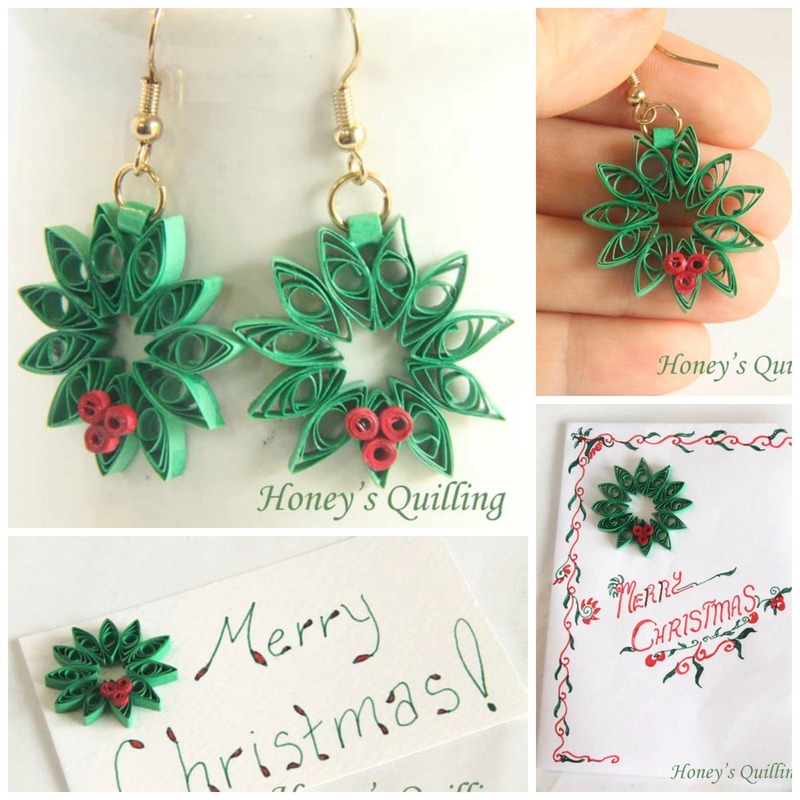 I simply adore Honey’s Quilling tutorials. Aren’t they simply stunning? Do make sure that you hop over and visit Honey’s Quilling website for MANY MORE inspirational ideas. 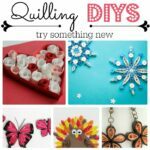 Want to learn more about paper quilling… get the paper quilling “stuff” and check out some of these ideas here on Red Ted Art!! Aren’t they adorable? Get your kit here – US/ UK!! They would make a lovely gift too! 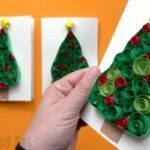 Paper quilled Christmas Trees centre pieces. These are so cute and clever! 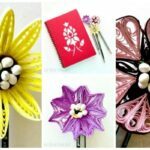 Paper Quilling Flowers – so sweet! 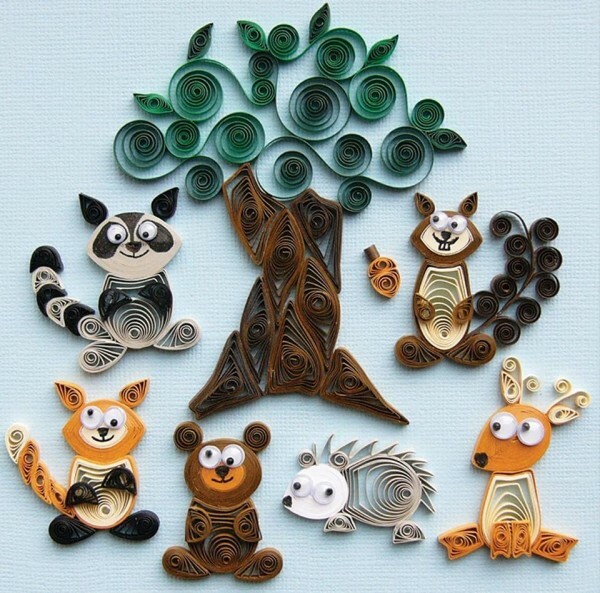 And a perfect introduction to “grown up” Paper Quilling! 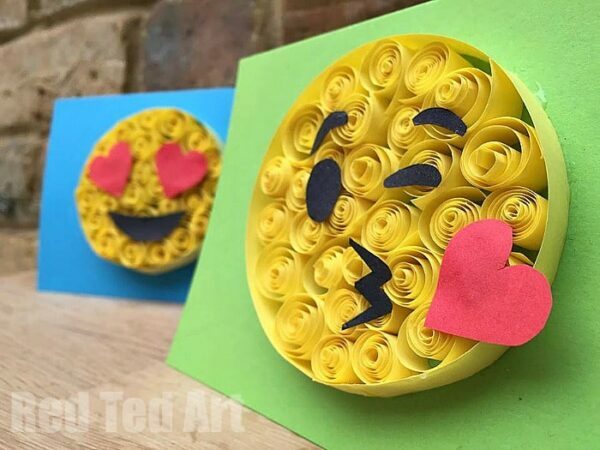 More quilling for kids with this fun Paper Quilled Emoji! Thanks again for the feature, it looks great! 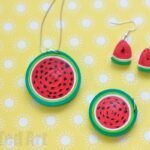 I hope some of you fun crafters out there give it a try! I am so pleased to have you guest post again 🙂 thank you! Oh wonderful! So happy to hear that! Oh wonderful! So pleased to hear it!